At ATA Martial Arts, we are driven to make a positive difference in the lives of each of our students and families. It is our firm belief that through building skills for life-using Taekwondo training-that we can make the world a better place, one black belt at a time. Likewise, our goal is to help students to better their lives through safety education, community awareness, and physical fitness. Our youngest students receive a tailored age appropriate curriculum that they will find challenging, but be able to succeed. They will develop an increase in confidence and discipline, all while having tons of fun! Junior students gain increased confidence and focus as well as discipline. Martial arts training is great for kids to excel individually while working with their fellow classmates as a team. Teenagers have positive influences with their fellow classmates and will learn to develop discipline,confidence, and self-defense which is incredibly beneficial at this age. Find out why the American Taekwondo Association is leading the way in martial arts training across the nation. Are you a parent who wants your child to build life-skills like confidence, discipline, self-esteem, and leadership? Maybe you are an adult who wants a feeling of security and the ability to resolve conflicts positively. Or would you like to maintain a higher level of fitness in a fun atmosphere? EXPERIENCE THE ATA DIFFERENCE FOR YOURSELF! Whatever you or your family's goals are, we can help you reach them. Over 1,000,000 people of all ages, ranks, and gender are enrolled in Songahm Taekwondo programs across the nation, making it the largest centralized martial arts organization in the world. Since Grandmaster Haeng Ung Lee founded Songahm Taekwondo in 1969, ATA schools have been offering the highest quality of professionalism and training. Today, over a million people are experiencing the Songahm difference by training both mentally and physically to better themselves! Most importantly, our program is dedicated to helping students of all ages to develop priceless skills and values for life. Alongside quality technical martial arts instruction, our instructors also specialize in helping students learn how to set and achieve goals. The underlying foundation for ATA Southport revolves around the concepts of positive emotion, discipline through structure, applying knowledge for positive change, and leaving a lasting legacy of leadership. Each of our programs is designed to help you meet your goals and is specialized to meet your training needs. Set up an appointment or call to find out more information about which program is best for your and your family. 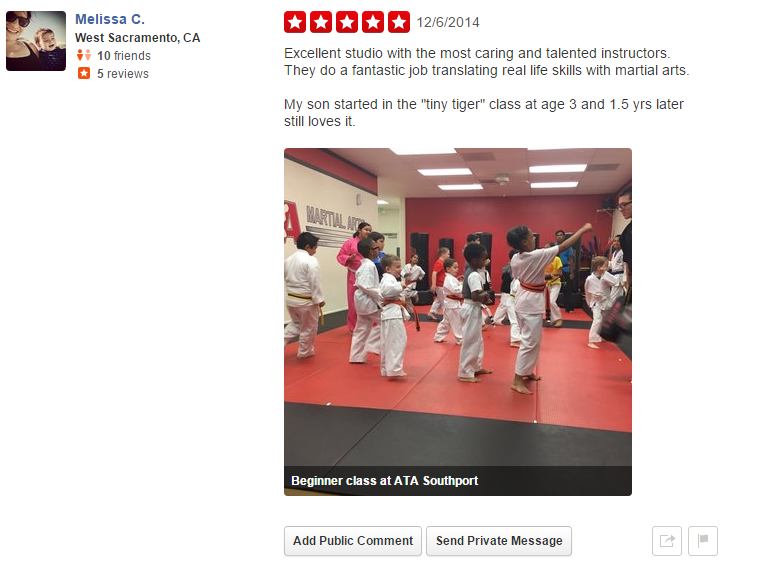 Jung's ATA Martial Arts of Southport is owned by husband and wife Team, Anna-Marie & David Jung. With the help of their dedicated staff, we know your family will love training with us!